We will be at the Hanover Book Festival again this year. Stop by and see us if you’re in the area! We are excited to announce the publication of Called to Follow, Book Three of the Going Deeper: A Journey with Jesus series. While it is book 3 in the series, it is a stand-alone book, so you don’t need to wait for the others to be published before you enjoy it. It is currently available in ebook format, with the print version expected to be available by February 15. The remaining four books in the series are in production and will be available soon. 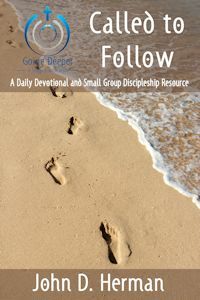 Called to Follow uses the outline of the baptismal covenant from the Affirmation of Baptism service to describe the characteristics of what it means to live as a disciple of Jesus. Christians at all points on their faith journeys will find this to be an in-depth and challenging companion. We learn to live daily, “walking wet,” living out our baptism, born anew to become the hands and feet of Christ for the world. Find it on Amazon, Smashwords, Barnes and Noble, or your favorite ebook store. We are pleased to announce that Summer Heat is now available in print! We are happy to announce the publication of Summer Heat, by David P. Hope. The ebook is available now at Amazon and Smashwords; the print version is coming soon. Those were the words that David Hope thought as his boat, Summer Heat, was tossed in a storm on its way to the Bahamas. This book is the true story of his life, from his first experiences in sailing through his career as a Chesterfield County, Virginia Police Officer up until his ship was caught in a devastating storm. It’s a story of humor, heroics, good luck and bad luck that recounts the tale of David and his crew (including Jammer the Wonder Dog), as they struggled to survive on Summer Heat. When disaster strikes, you need everything you have learned in life. David Philip Hope served as a first lieutenant in the U.S. Army during the Viet Nam War era after graduating from Infantry Officer Candidates’ School, Fort Benning GA. He completed his undergraduate degree from East Carolina University with a B.S.P. in Criminal Justice. He then served as a police officer in the Chesterfield County Police Department, Chesterfield County, VA from 1976 until his retirement in 2002. He rose to the rank of police major and ultimately had 250 police officers, supervisors, and managers in his command. The author lives on the Outer Banks of North Carolina with his fiancée and his English springer spaniel. From there he sails the waters of Chesapeake Bay, the Albemarle and Pamlico Sounds, and south to Florida and the Bahamas. He has said many times that he is happiest when on his boat. If you happen to be in the Mechanicsville, VA area this weekend, Rambling Star Publishing will have a booth at the Hanover Book Festival. We will have copies of Around the World in 80 Years and Heading South available for purchase. Come see us! 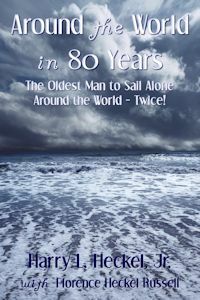 Latitude 38, a West Coast sailing magazine, has published an article about Harry Heckel, Jr., and the publication of his memoir, Around the World in 80 Years, in its July 2013 issue. The issue is free to download and view online – you can find the article on page 73. We are pleased to announce that Florence Heckel Russell’s next book will be available soon. 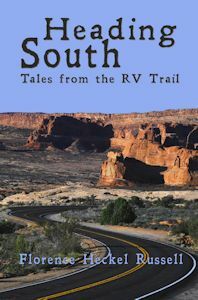 Heading South: Tales from the RV Trail recounts Florence’s adventures on the road in her RV. Great summer reading! At the advanced ages of 78 and 89, Harry L. Heckel, Jr., fulfilled a dream: he sailed alone around the world, not once, but twice! This Old Man of the Sea goes global, describing with a dry wit and a keen eye, the 54 countries and islands he visited, plus the sail to get there. Armchair travelers and sailors alike will be enthralled by the adventures of this Ancient Mariner: from the Killing Fields of Cambodia to the Great Wall of China, from avoiding pirates off Somalia to almost capsizing off Madagascar. An inspiring tale that proves that age is no deterrent to fulfilling your dream! Available at Amazon, Barnes and Noble, and Smashwords. We’re currently working on getting the website for Rambling Star Publishing set up. In the meantime, please look for our new release – Around the World in 80 Years – at Amazon, Barnes and Noble, and Smashwords. Sign up to get updates on new releases, promotions, and other news. Rambling Star Publishing is the non-fiction imprint of Blue Oranda Publishing.